Precedent for a Dying Messiah? Those entertained by heavy-handed debates won’t want to miss the to-and-fro between Richard Carrier and Thom Stark in the following series of blogposts. Both Carrier and Stark are shrewd thinkers, and I always enjoy reading their work, even in disagreement. For instance, I’ve disputed Carrier’s take on the resurrection view of I Cor 15, just as I’ve taken Stark to task over his claim that Paul was calling for grassroots political activism. But here Stark wins a slam-dunk. The question is, did any pre-Christian Jews believe in a dying messiah? And the answer, as most of us know already, but in case you have any doubts explained at length by Thom Stark, is none that we know of. Two pre-Christian texts are relevant here. The second text is the one that needs attention: the Melchizedek Scroll (11Q13), which connects Isa 52 (though not Isa 53, where the servant suffers and dies) with Dan 9. But as Stark explains, it doesn’t connect the two based on any belief in a dying messiah. It doesn’t mention an anointed one who was “cut off”, and of course most scholars believe that Dan 9:25 (not 9:26) is in view. The pesher technique cherry-picked verses without regard for surrounding context, and that’s what the scroll does. Carrier, however, insists that the “anointed one” of Dan 9:25 is identical to the “anointed one” of Dan 9:26, and even claims that was the original meaning in Daniel — that both verses referenced Onias III. Sane and sensible experts know that Dan 9:25 originally referred to either Zerubbabel or the high priest Joshua in the sixth century BC (when the Jews returned from exile in Babylon), and only Dan 9:26 referred to the high priest Onias III over 400 years later (who was executed in 171 BC). And of course, the atonement referred to in Dan 9 was originally about the establishment of the temple cultus at the end of the sixth century, certainly not the anointed one of Dan 9:26 getting “cut off” — which was an interruption in atonement, as Stark says, when the high priest was supplanted with an illegitimate usurper. This second anointed one, this “executed messiah”, needless to say, was not seen as a salvific or redemptive figure. So how does the the scroll reinterpret the first anointed one, the Zerubbabel/Joshua figure of Dan 9:25? In Stark’s view, he is both Melchizekek, the anointed one of the spirit, and also the scroll’s messenger. But it’s equally possible that the scroll envisions a human messenger (perhaps a high priest, perhaps a prophet) proclaiming the rule of Melchizedek. The crucial point (in the debate between Stark and Carrier) is that the anointed one (Melchizedek) is no longer human, rather an angelic warrior, who like the archangel Michael in Daniel is Israel’s redeeming figure. Neither dies, let alone atones for peoples’ sins by dying; rather they defeat the powers of darkness at the end of 490 years. [In Daniel, the the 490 years are split up between 49 years, 434 years, and 7 years. In 11QMelch, they are split up by ten groups of 49 years, and the drama is set at the beginning of the last 49 years of the 490-year period.] “The Day of Atonement takes place when the captives are liberated,” says Stark, and “in 11QMelch, this occurs when Melchizedek defeats the forces of Belial. In Daniel this would occur when Michael defeats the armies of Israel. In both texts, the captives are set free.” Needless to say, this critical event doesn’t occur at the time of the “cutting off” of Daniel’s second anointed one, for the death of Onias started an evil period — again, a period devoid of atonement — which would end seven years later upon the liberation of the captives. The figure of Melchizedek is fascinating to me — and what really prompted me to call attention to the Stark/Carrier debate — as I have an abiding interest in pre-Christian angelic figures. Dale Allison’s suggestion that Jesus thought the Son of Man was his heavenly twin or Doppleganger is strangely plausible, and Pieter Craffert has proposed something similar (independently of Allison), based on sources where a heavenly son of man figure seen in a vision turns out to be the visionary himself. One can’t help but wonder if Melchizedek is some sort of heavenly analog to the two earthly messiahs of the Qumran texts. I want to thank Thom Stark for his in-depth treatment of 11QMelch, which for all its focus on debunking Carrier’s claims, is an enlightening analysis of Melchizedek on its own. Insofar as Jesus’ existence goes, what does Stark’s victory over Carrier prove? Perhaps not much. It just puts us back to square one with the problems surrounding the criterion of embarrassment. Granting that Carrier is off-base about a precedent for a dying messiah, lack of precedent is in itself no obstacle to claiming wild things. The early Christians could have invented Jesus, and could have invented the whacky idea that he effected redemption through shame and death. But we deal in likelihoods, or what’s most plausible — not what is simply possible — and for all the scholarly abuse of the criterion of embarrassment, there is something to be said about the cumulative effect of Jesus traditions that cut against the grain of common expectation. People invent wild things, but people also take real-life events and run wild with them. When wholesale invention is involved, it’s seldom in a way that’s so thoroughly self-defeating. The lack of precedent for a dying messiah doesn’t prove Jesus’ existence, but it’s one of many striking oddities that when added to others points to an historical figure beneath the fantasy. Prometheus may not be a work of art, and it certainly has a whacked evolutionary premise, but it’s the best installment in the Alien franchise since the ’70s classic. Aliens was impressive for its day but now looks like what it is, an ’80s action flick with the hollow characters and dull plots typical of James Cameron. Alien 3 was a return to form under David Fincher, with awesomely mean-spirited characters and a haunting atmosphere, the only problem being the alien itself didn’t impress (at all). And the less said about Alien Resurrection and the -Predator bastards the better. 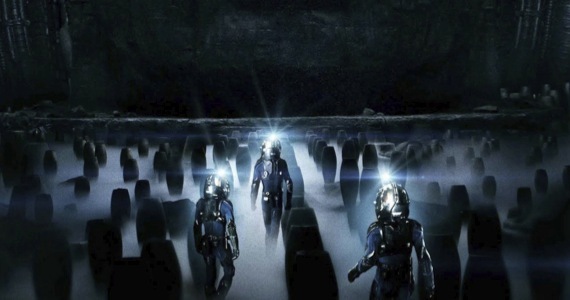 Prometheus relies on certain strengths of the second and third films, while tapping into the elusive power of the first, and lands decent enough results… as long as you don’t expect too much out of it. Which he does near flawlessly — but even he fails to mention the most superior (and terrifying) aspect of Ridley Scott’s alien that Cameron ruined: its ability to cocoon a victim and cause it to morph into an egg/facehugger. From Aliens and beyond, all eggs/facehuggers come from a queen alien, but Scott had envisioned a truly awful process by which any alien, regardless of gender, “laid eggs” by transforming captives. In Cameron’s film, the aliens are just giant insects with essentially “Earthlian” life-cycles, and can be killed with enough firepower. In Scott’s classic, the alien was a near invincible horror, and Prometheus fleshes out why: the species is biomechanoid, an engineered lifeform that hyper-evolves in nebulous and unpredictable ways. Prometheus has been panned by many, but some of its alleged faults I actually count as strengths: the lack of a dominating boogey-alien (a refreshing change in direction, and surprisingly anti-Hollywood), leaving many questions unanswered (as with demonic possession, too much explanation of disturbing aliens can ruin the mystery, and in any case I guarantee there will be a sequel showing how the facehuggers get to the other moon, no doubt with Dr. Shaw and Android David in tow), and the injection of faith and philosophy (which is treated for the most part in an acceptably non-hokey way). My only serious objection is to the prologue, set four billion years in the past, where a pale anthropomorphic alien (an Engineer) is seeding Earth with its DNA. This implies that bipedal hominids are the inevitable outcome of evolution, and may please philosophers like Daniel Dennett, but I subscribe to the view that evolution has no such direction or purpose. Rewind the tape of life, let it replay, and you’d just as likely get intelligent, self-conscious grizzly bears. On the other hand, I do like the way the Engineers are stand-ins for gods/creators who make humans in their image, and, even better, how they turn out hostile to their creations. (I just wish Scott had married this idea to evolution in a better way.) There’s a not-so-subtle play on divine retribution here, though of course this is where questions start overtaking answers: Why exactly are the Engineers so intent on destroying their own creations with the black goo? Are the urns meant to be dropped on earth as the next phase in humanity’s evolution? Are the genetic results to be used as pawns in an intergalactic war? Is this a renegade faction of Engineers, indeed as many have suggested, the equivalent of “fallen angels”? And is the black goo a prototype for the xenormorph aliens, or vice-versa? This goo stored in urns on LV-223 does a variety of things — animating corpses, transforming worms into huge snake-monsters, and converting human sperm into a squid-like parasite that can grow inside the womb of the most barren woman. (This last results in a fantastic scene in which an hysterical Dr. Shaw gives herself a caesarean-abortion, the closest WTF moment we’ll probably ever get to Kane’s classic chest-bursting.) The egg-facehuggers on LV-426 in Alien, of course, behave differently. Many fans seem to think the goo precedes the xenomorphs, but the mural in the LV-223 facility shows a xenomorph, so the aliens appear to already exist. 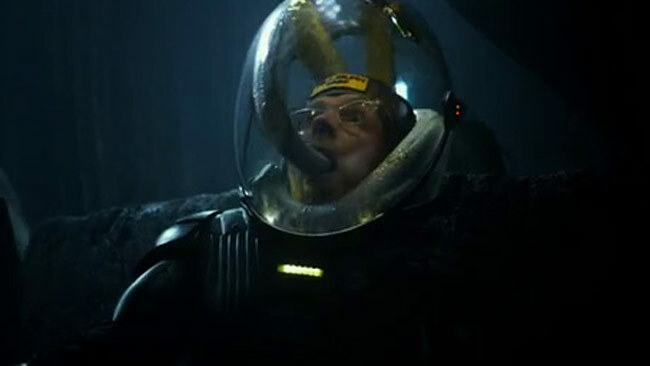 And yet the final scene of Prometheus has a xenomorph bursting from the Engineer’s chest, as if it’s the end result of everything and the first of its kind. There is a particular scene in which a character behaves so stupidly it’s offensive. Millburn has been left behind in the caverns when suddenly a cobra-like tendril rears menacingly out of the water. Millburn actually approaches the thing, reaches out to it, calling it “beautiful” — and then compounds his idiocy by reaching out to it again after the thing hisses and lashes out at him. Completely unlike Kane in Alien, this fool got what he deserved (see above photo). But this display of stupidity, or naive innocence, is so off the scales that it made me wonder if Scott was perhaps making a stab at biblical allegory, with a “deceptively friendly” serpent. If so, he failed miserably. 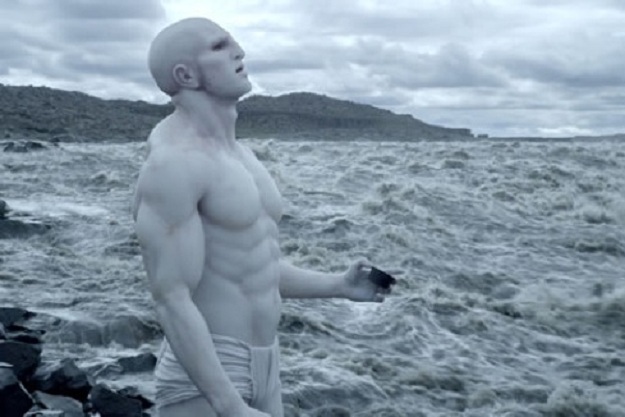 Going into Prometheus with high expectations may account for some of the strong disappointments amongst fandom, and this is probably where I got lucky. My expectations were quite low. Not only because Ridley Scott hasn’t made a decent film since his Alien and Blade Runner days (his historicals are abysmal), but because the Alien franchise has been soulless for so long. 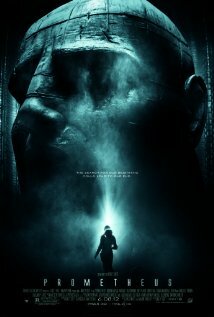 If the inevitable sequel to Prometheus matches what it did here, I’ll be okay with it, if not ecstatic.